Hatters boss Nathan Jones has warned his side to make sure they avoid a repeat of their performance at Barnet when facing Exeter at St James Park this evening. Luton had travelled to the Hive on the back of a thumping 8-2 victory over Yeovil on opening day, before returning home with a 1-0 defeat, in what was a thoroughly lacklustre performance. We’ve got to make sure the same thing doesn’t happen tomorrow night against a very good Exeter side. Town now head to the Grecians after putting seven past Stevenage on Saturday, and Jones urged the players to guard against a similar result. He said: “They’re a real grounded bunch, it’s just about being focussed on the next game. “What happened last time we scored lots, we lost our next league game against Barnet and we were nowhere near the same attacking force. “We’ve got to make sure the same thing doesn’t happen tomorrow night against a very good Exeter side, so we’ll be doing the things that we do and giving them an extra bit of diligence not to let that happen again. 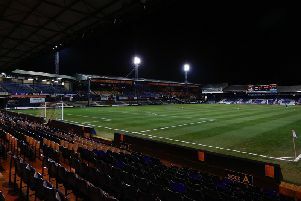 Victory for the Hatters could put them top of the table, if leaders Notts County fail to win at Crewe. Jones continued: “We don’t think they’ll need any motivating as Exeter are above us in the league, they’ve been early pacesetters, we know what it means to us in terms of where it could put us. Meanwhile, Luton’s victory over Stevenage on Saturday meant Town have now won three games in a row for the second time already this season, something they only managed once last year. Jones added: “We’re pleased because we’re not losing games, we’re picking up points and that’s the main thing. “We’re above two points a game which is the benchmark to get promoted, that has to continue. “It’s only 13 games, we’re just under a third through the season so it’s a long, long way to go. “As I said, we’re in good place, we’re playing well, we’re scoring goals, we look like we can win games which is a real bonus.